of a ladder built into the Bridge Street bridge. Question: What do Paris and New York have that Newark does not? Answer: A huge community of artists using their own city as subject and inspiration. 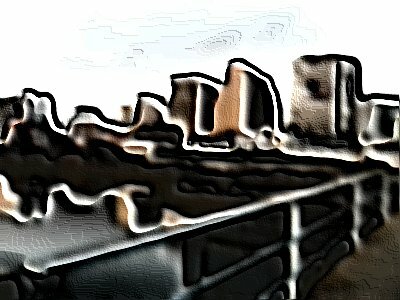 Newark does have artists, but does NOT have the kind of artistic "scene" that New York and Paris have. In New York, if you go to Greenwich Village at certain times, in good weather or during an art festival, you can see original paintings of New York scenes hanging on fences or displayed on easels. Folding tables all over Midtown and Downtown Manhattan display photos, drawings, and original paintings of New York scenes. Bookstores and art galleries regale visitors with views and photo essays about New York. Without question, New York deserves much of the attention it gets. 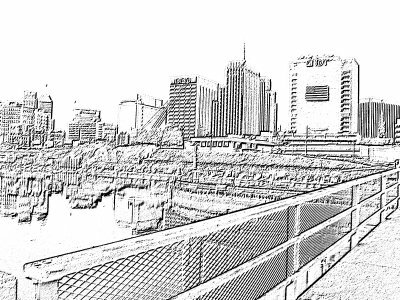 It is a fabulous, world-class city. That does not, however, mean that nothing near New York deserves attention. 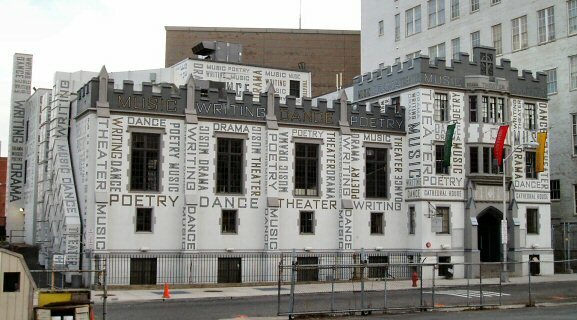 of Newark's homage to the arts. The brown wall behind is the back of NJPAC. In Manhattan you might chance across artists at work. Rarely or never in Newark will you run across an artist sitting before an easel while painting the scene before him (or her). 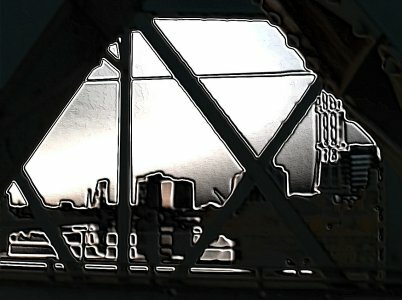 Does the absence of such an artistic community, employing Newark locales as inspiration and subject, mean that Newark is unworthy of artistic attention? Certainly not. Much of what makes New York or Paris worthy of artistic note is the INVENTION of artists, plucked from their imagination more than presented as de-facto, photographic representation of what IS. Artists impart their VIEW of a subject. They do not just put before you what is already there that you can see on your own. 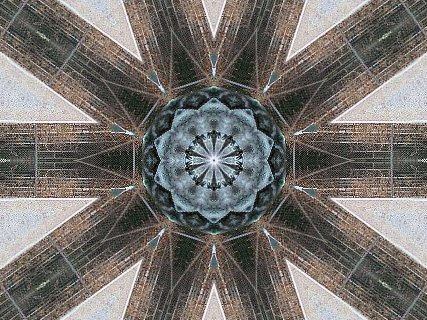 Artists imprint their creations with their own personality and vision, so that what you see is NOT what you get if you go to the same place and look up. It is enhanced by the appreciation and enthusiasm the artist brings to seeing it for himself. And you are swept up in the artist's enthusiasms. Newark lacks such magical images. What people presently think about Newark all too often draws upon old headlines and cautionary tales from decades past. None of that has any bearing on the Newark of today. To dispel old misperceptions, let us start by revisiting the very name "Newark". Some people, like the poet Amiri Baraka (born Leroy Jones), like to cast Newark as a "New Ark", a vessel of salvation from death by drowning in a sea of hostility. Is "New Ark" an accurate rendering of the name? Perhaps. Perhaps not. Another version of the name of this old city (founded by Puritans in 1666) is "New-Worke": that's "work" with an E on the end that doesn't change the sense. 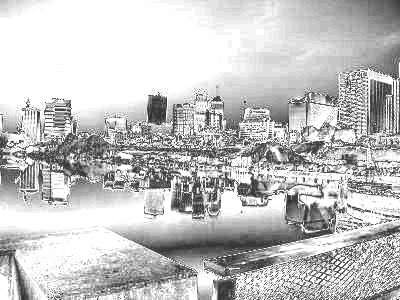 Yes, this city is a New Work, a work in progress, yielding new understandings to those who would heed. 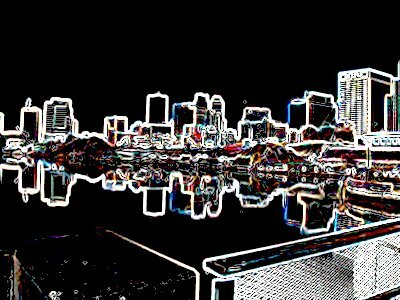 So let us try to imagine what NewWork would be like if it had an artistic community of size and talent, in LOVE with Newark and eager to show the world what this wonderful city is like. I take pictures. I am not an artist so much as a photo-journalist for Internet purposes. But I recently bought a new computer on which came installed JASC Photo Shop Pro. 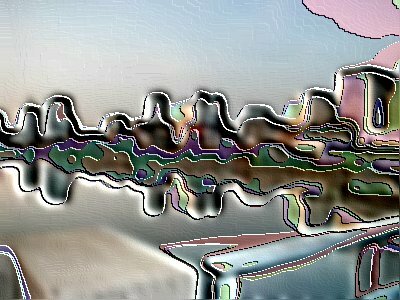 This program has a number of wonderful features, including an "Artistic Effects" section, as well as tools like "Sharpen/Sharpen More", that I used to create the graphics below. 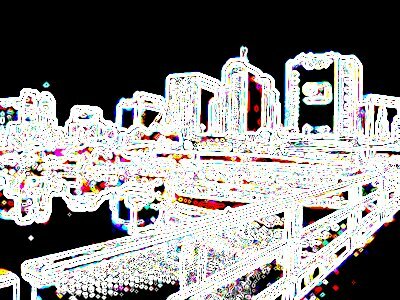 This first group of photos shows what the view of Downtown Newark from the Bridge Street bridge might look like to artists working in various media. "Media" for artistic purposes means things like hammered copper, molded aluminum foil and colored foil, baked enamel, oil paints, colored pencils and chalk, charcoal  even computer software. Here is the base, representational photo of the scene from which the variants were made. Not bad, huh? That really is what Newark looks like. Now, the variants. 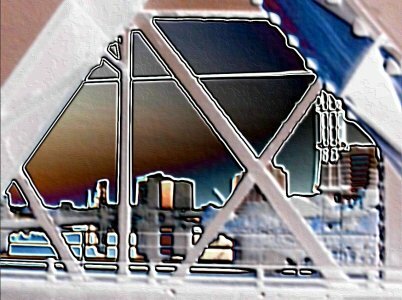 The "Foil" effect produced this picture. 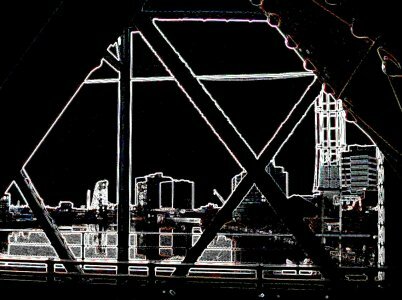 The "Colored Edges" option produced this homespun picture. Now, the "Colored Foil" effect. 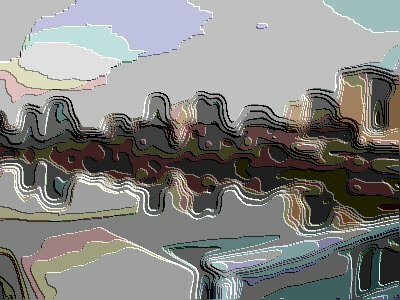 The following picture is an extreme-abstract vision produced by JASC's "Contours" effect. This is the "Glowing Edges" effect. 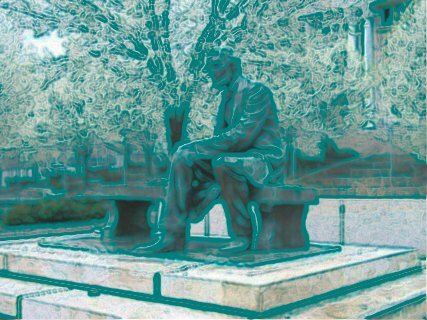 Here is the "Colored Pencil" effect, with blue as the dominant color. Any color could be dominant. I chose blue. 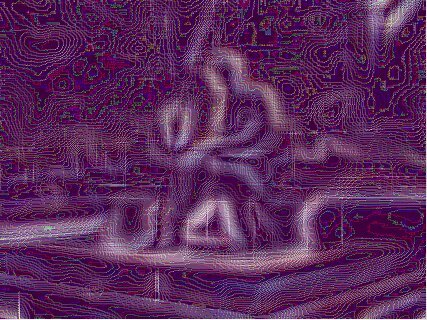 This, now, is something called a "Topographical" effect. 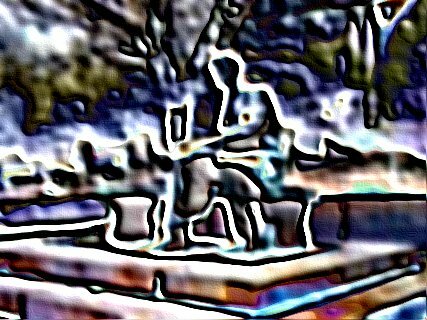 And here I present a "Brush Stroke" view, as an impressionist with a wide brush (or palette knife) might represent the same scene. NOW, a new photo and a few variants. 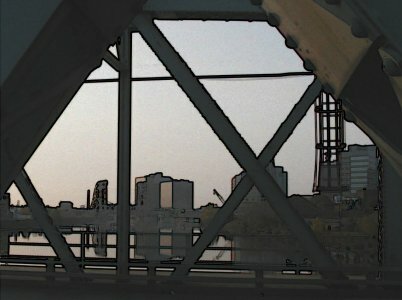 This base photo was taken from the same general vantage point as the photos above, the Bridge Street bridge from the Harrison side. Now, a version of the same scene as it might appear in a charcoal rendering (by an extremely exact draftsman). And here is a variant employing more than one effect. 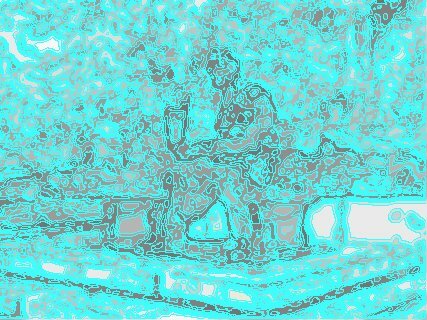 Here is one version of the "Glowing Edges" effect, with one setting. 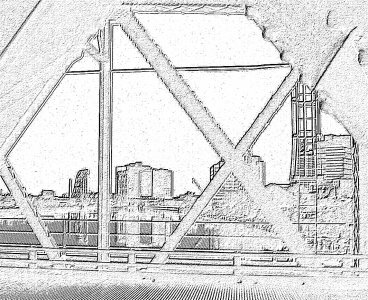 And here's the same effect with a different setting. Now, the 'neon glow' effect. I don't know why it's called that. It seems much too subdued and dignified to warrant the word "neon" appearing anywhere in its name. 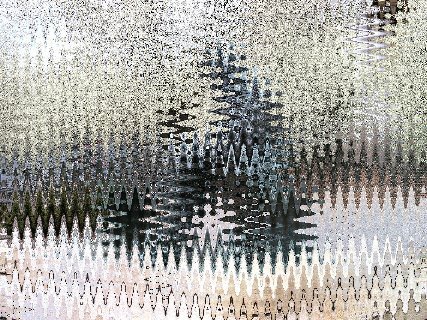 Now we go to the third photo I manipulated into variants. Here is the base photo, a cropped view of part of the more-remote skyline of Newark as seen thru the Bridge Street bridge. Here's the "Colored Edge" variant. The difference is subtle, but it turns a photo into something more like a painting. Now, a Colored Foil view. 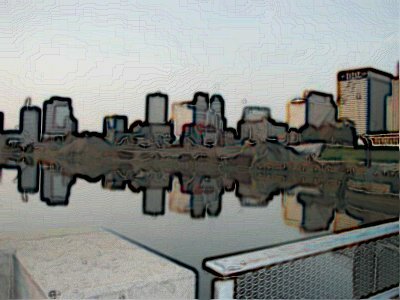 And here is what the picture might look like if it were a mosaic. 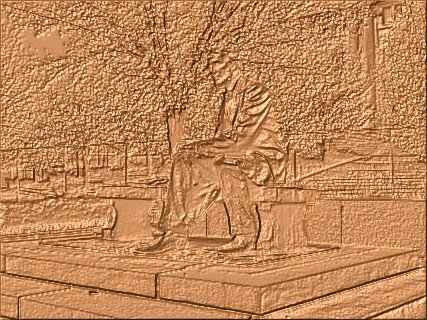 Here's JASC's "sandstone" effect. I don't see any sandstone, but I do see an interesting 'take' on the same view. Here's another photographic effect, JASC's "wood" texture. 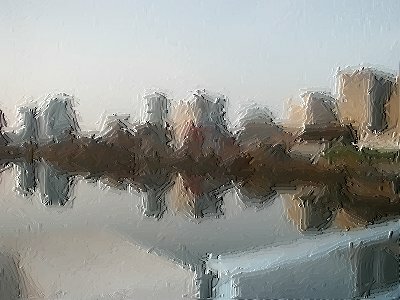 Here's a textured view that shows how the picture might appear if painted on tiles. 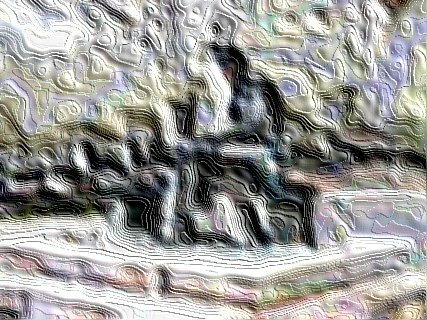 Here's the final "Texture" effect on the same photo, "Denim". Here is a variation as tho drawn by pencil. 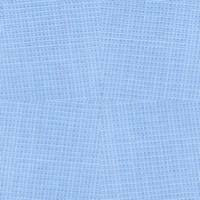 It may seem a little washed-out by comparison with the others. Try to see it for itself. And here's the last variation on the base picture, employing the "Glowing Edge" effect. 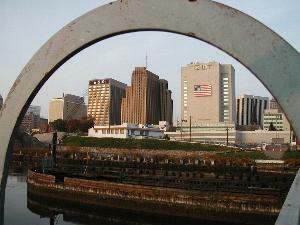 There are of course many other sites in Newark on which artists might focus their attention  the Cathedral Basilica; the various outdoor statues (George Washington in Washington Park, "Wars of America" in Military Park); the ornate flagpole in Lincoln Park; the view from the Jackson Street bridge; flowering cherry trees in Branch Brook Park; the Baptist Church Downtown with its distinctive dome and tower; and many more. 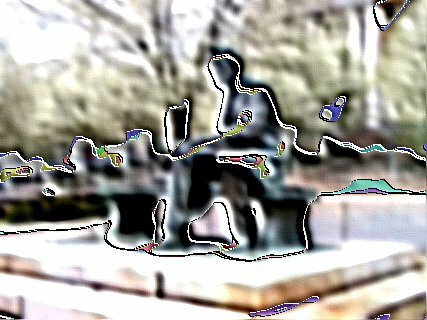 Here I present computer-generated variations on Gutzon Borglum's statue of Abraham Lincoln that sits in front of Cass Gilbert's Old Essex County Courthouse at Market Street and Springfield Avenue. This is the base photo. 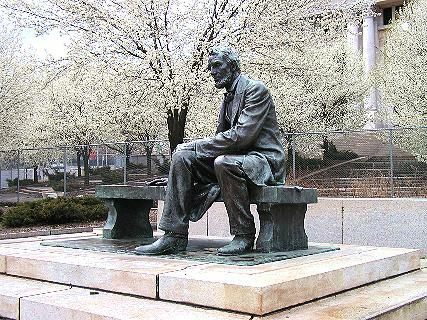 I hasten to point out that, for reasons beyond my ken, Essex County chose to cut down (or otherwise remove) all the flowering trees around this statue, so what follows has something of the quality of a "Lost Newark" photo collection. Let's start with a "Chrome" effect. 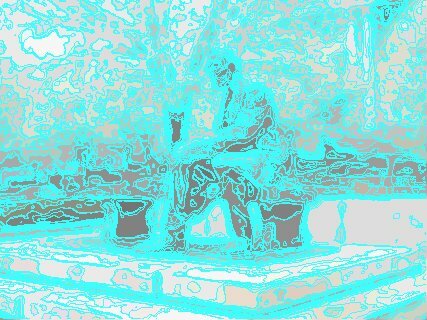 Now, an aqua-colored version, impressionistic in nature. Here's the same general idea with variations to create a more generalized aquamarine color and splotchier details. Here's a variant that an abstract artist working primarily in purple pencil might create. 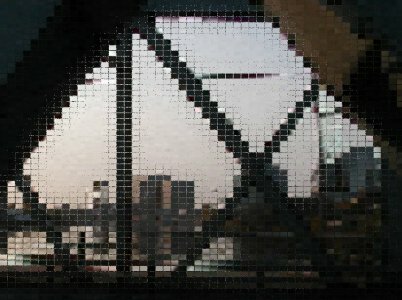 How about a pointilistic view? Now, in a sharp departure from the basically monochromatic view above, I present two pix that both employ the "Enamel" effect, with different settings. And here's a really jazzy rendering via the "Colored Foil" effect. Here is a largely monochromatic green and blotchy pseudo-painted view. 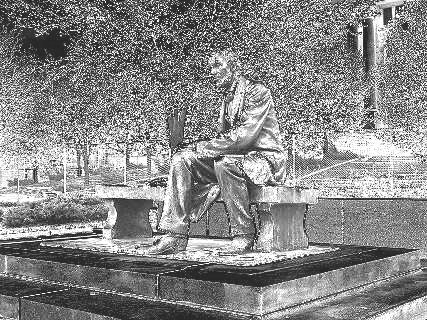 And here is a wholly monochromatic rendering that shows what the base photo might look like if hammered into copper. Most of the images above could be created by human beings with their own hands, in various media. 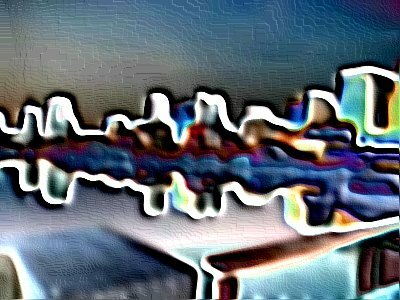 Now I present some photo-manipulation views that show what even today's inexpensive computer graphics programs can do. 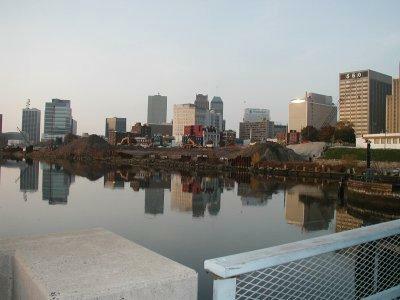 This suggests what the base photo might look like if transferred to a brick wall here in "Brick City". Here's a super-abstract version using the 'pixelated' tool. 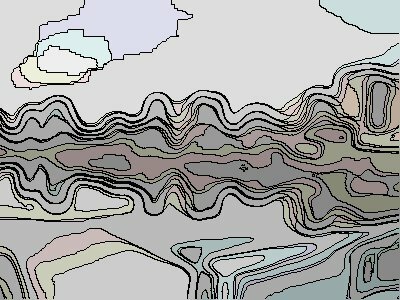 Here is another entirely unrecognizable, computer-created abstract view, using the "Wave" texture. Now, a cute picture of how the photo might look if bisected vertically by a mirror. Well, the rumor in historical circles is that Lincon WAS gay! 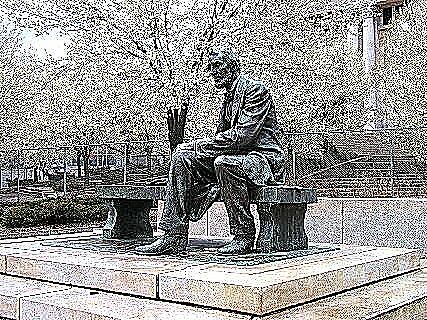 Finally, a picture only a computer is likely to be able to create, with absolutely NOTHING about it recognizable as the Lincoln statue. But ain't it purty? The everyday is not the only way to see. 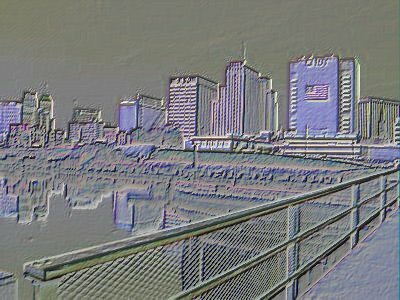 And Newark as it might be seen by tourists and media could be a great deal more interesting and magical than it now seems, if artists employed it as their inspiration. Permit me, then, to make a suggestion to the artists out there struggling in New York and other art centers in a hugely overcrowded market: come to Newark, an uncrowded field with an audience eager to see Newark  or anything in New Jersey  made magical. Housing costs and, if you're inclined, separate-studio costs are much, much lower than in almost any part of New York City, including the most remote parts of the Outer Boros. Costs of many kinds are also generally lower, from groceries to gasoline. And sales tax in at least parts of Newark is only 3%! (That's because of the state's Urban Enterprise Zone program, which is designed to promote business development in disadvantaged areas. This program could be used to establish small businesses such as galleries and coffeehouses at reduced tax levels. Government loans may also be available.) There is an arts scene, if small, into which to integrate. Were people so inclined, they could concentrate in a given neighborhood (say, Vailsburg or near Downtown) to create a new Greenwich Village or Soho, replete with coffeehouses, galleries, performance spaces, and an ambiance conducive to creativity. 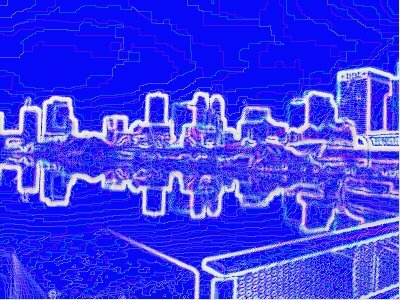 Because Newark is so relatively small, an artists' organization would be able to make quick and easy contact with people high up in government and the business community, something you are not likely to be able to do in New York. An artists' cooperative could bring collective purchasing power to bear on getting good prices on basic materials and could create group shows. There are some existing display spaces waiting to be filled. 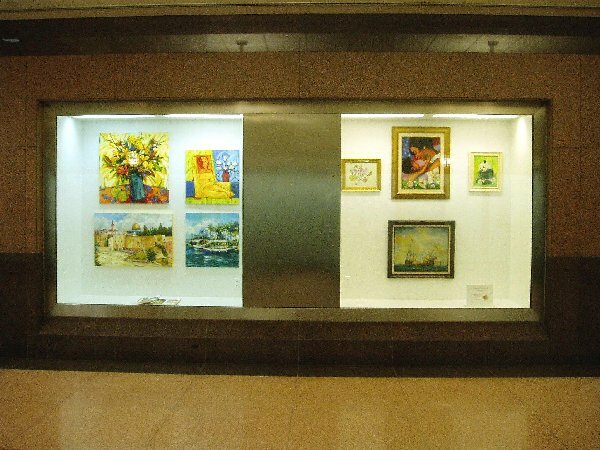 For instance, Two Gateway Center has two display cases that show artworks, but sometimes they are largely empty. I bought two paintings from that mini-gallery, and I imagine the building's management (Landmark Properties) would be glad to have more local artists clamoring to show there. Here's a picture of that display case as it recently appeared, with both cases in use. The right window holds the works of one artist; the left, those of one other, but sometimes several artists' works appear. Media too are more accessible. 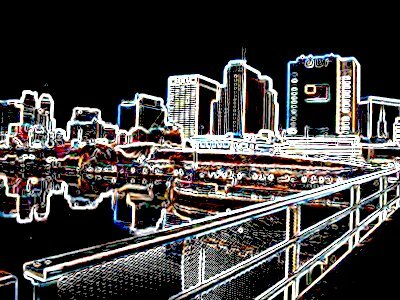 Newark has one major newspaper, The Star-Ledger, which is always looking for human-interest, local color, and artistic happenings to report. 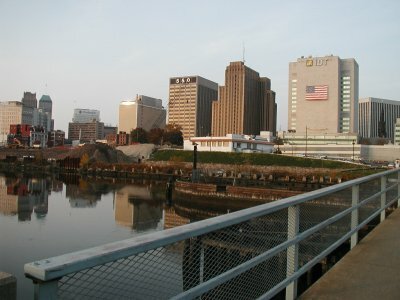 There's also a radio station known very widely for its jazz programming, WBGO (which has a very jazzy website at www.wbgo.org), and a studio and office complex of the PBS broadcaster, the New Jersey Network (NJN), in Downtown Newark. Videographers focusing on local matters and artists working in New Jersey would find eager listeners if not actual partners at NJN. Central Newark is only 12 miles from Greenwich Village, Soho, Tribeca and their host of arts institutions. No, you can't walk your canvas over, but if you live in Newark, and especially if you start or participate in an artists' cooperative, you likely will be able to afford a car or use a co-op's van to carry a representative selection of your work to Manhattan. Once you're in Newark, your world expands. Manhattan is not the be-all and end-all of the universe. There are, believe it or not, galleries in the (wealthy) suburbs  egad! he said "suburbs"! I suspect there's a fair number of galleries in the 'burbs, cities, and small towns all around New Jersey eager to display  and sell  the work of local artists. From Montclair to Lambertville (opposite New Hope, Pennsylvania) to Red Bank and Asbury Park, New Jersey is full of people looking for a little art to fill a space on a wall, serve as a conversation piece, even, believe it or not, deepen their understanding of life. The classier suburban malls might be happy to host occasional art shows in the corridors, like a Spring Salon and Fall Salon. And people in suburban malls come to spend money, not just to look. If there are enuf artists in Newark to push for such a display, the various arts organizations in Newark (the Newark Museum, Aljira, NJPAC, and the various colleges) might put together a Newark Newart Expo to display the works of Newark's hip-and-trendy crowd (see the October 3, 2004 entry to my "Newark USA" blog). There are also museums in other parts of New Jersey eager to show off local talent. And Philly's not far, with a whole new world of galleries, museums and crowds of pedestrians. New Hope and Bucks County, Pennsylvania are another artistic venue you may never have thought about but would have ready recourse to if you were based in Newark. So, come on over! Newark's art scene is not so diverse as New York's, but neither is it overpowering and confusing. 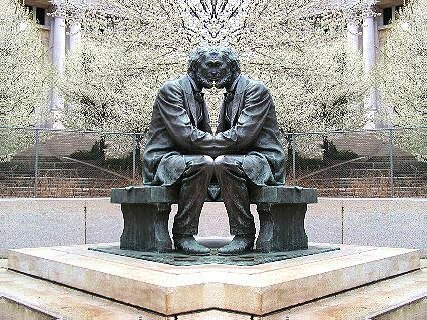 At end, it is the quality of the people, not their number, and the quality of interaction, not the mere, theoretical possibility of interaction, that matter. Most New Yorkers rarely, actually visit any of the multitudinous museums they cite as reason for living in New York. You might find you become more engaged with the arts after leaving New York than you were while living there. 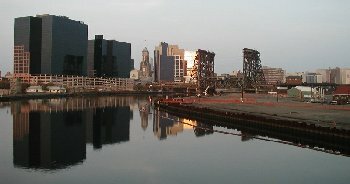 You artists or would-like-to-BE artists in other parts of New Jersey or in nearby Pennsylvania, Downstate New York, and elsewhere, consider moving to Newark. Get in on the ground floor, make contacts easily, and find people who can actually take a little time to tell you if you have talent, maybe take you under their wing and point you in the right direction. Actually knowing and interacting with two caring artists is better than being surrounded by thousands who couldn't care less about you. Come be a big frog in a small pond. You may end up being a big frog everywhere. 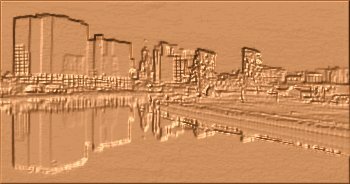 Let me close by showing two views of Newark at dawn as seen across the glassy Passaic River from the Jackson Street bridge, representational and as it might appear if pounded into copper.